Iconic local weaves shine bright in the city that makes it happen. 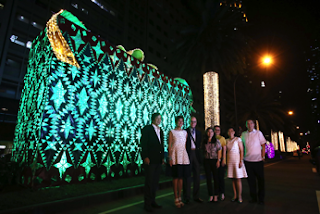 The leaders of Ayala Land Corporation and Makati City spread the holiday cheer, showing off their smiles with the stunning street lights display inspired by iconic weaves from various regions -- Inabel and Burdado from Luzon, Banig Tikog from Visayas, T’Boli, Ukil and Yakan weaves from Mindanao. (L-R) Ishmael G. Cruz, Board of Governers of MaCEA; Patricia Zobel de Ayala; Jaime Zobel De Ayala, Chairman Emeritus of Ayala Corp; Vice Mayor Monique Lagdameo; Ms. Jhie Greenwood, Trade Marketing Manager, Firefly Lighting; Meean Dy, Group Head, Strategic Landbank Management; Bobby Dy, President and CEO of Ayala Land Inc. Inspired by the beautiful native hand woven fabrics from Luzon, Visayas and Mindanao, Makati City welcomed the Yuletide season with a traditional street lighting ceremony – an annual tradition that transforms the premier business district into a Filipino Christmas haven. Paying tribute to the cultural heritage of the Philippines, Christmas symbols with intricate Filipino patterns from various regions -- Inabel and Burdado from Luzon, Banig Tikog from Visayas, T’Boli, Ukil and Yakan weaves from Mindanao -- will illuminate the streets of the central business district, creating a festive and harmonious atmosphere. The whole stretch of Ayala Avenue, Paseo de Roxas, and Makati Avenue will be adorned with colorful lights that bring to life the spirit of Christmas. This is the largest display of Christmas lights in the city and a well-loved Makati tradition that has brought the community together. This year’s bright and energy efficient lights are courtesy of Firefly Lighting Corporation. Makati’s Christmas street lights continue to brighten up Christmas celebrations every year for everyone—from the thousands who work in the city to those who call the city home, as well as those who visit its various business, lifestyle, entertainment and cultural destinations. Today, Ayala Land has a total of 23 sustainable estates and is present in 55 growth areas nationwide. It has five residential brands, namely Ayala Land Premier, Alveo, Avida, Amaia, and BellaVita, which deliver quality homes to a broad segment of the housing market. Its commercial development and leasing portfolio is comprised of Ayala Malls, Ayala Land Offices, and Ayala Land Hotels and Resorts Corporation.